This months UXPA event was called 'How to develop a creative culture within a company', which really interested my team at work. Sadly they could not make it, so I was sent to report back. First up was Charlotte Gauthier from The Guardian. She spoke about what is creativity and why do we need it? These are good questions and she went on to answer them in a very entertaining way. She suggests that a work force who are encouraged to be creative are happier, which makes them more productive, which in turn makes more money for the business. So how do we encourage creativity at work? Next we had Helen Wood speak. I was a bit disappointed with this talk as she seemed to have missed the point a bit. 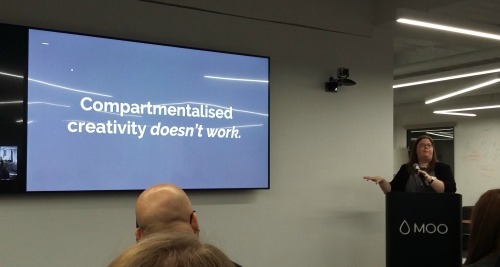 Not only did she not speak about developing a creative culture but she also seemed to have misjudged the audience, telling us basic UX things which we really should know by now. However she did say something I found very interesting. She said that we need to allow time to be bored as this space allows us to be creative. If we keep our nose to the grindstone the whole time we cannot be creative. Last up was Cal Rowston from Fjord. 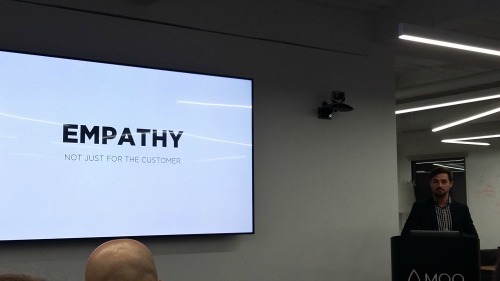 He spoke on how empathy is not just for your customers. He suggested that we need to empathise with the teams we work with in order to work with them well. We need to value everyone in the team. A creative culture is not just for the Design Team it is for everyone. However for most people that's not part of their job description so we need to find ways to make others love creativity as much as we do! Empathy can help. We should find out about the people we work with, and not just work stuff. Explore people's interests outside of work. Find out where they worked before and what they did, you might find they have expertise you can use to the teams advantage. And welcome criticism. Your going to get feedback anyway, you might as well get it as soon a possible so you can do something about it. As Cal said anyone can have an idea. It was a really interesting evening which gave me plenty of things to take back to my team. I know it will take time but maybe we can show our colleagues that they are creative too.